Iron Mass is a mass gainer, but there aren’t a lot of mass gainers like Arnold’s Iron Mass! This is easy to say for us, having recently tried all of the top mass gainers of 2015. So what makes it different? The truth is, that it’s all in the subtle changes Musclepharm made in honor of Arnolds product line. Let us tell you why, and how it made the difference for us! Compared to other mass gainers, Iron Mass tastes better and takes less of a nutritional compromise for simple macros. Each serving of Iron Mass contains approximately 485 calories. Contained in that calorie count is 40 grams of protein, 34 grams of carbs, and 21 grams of fat (mostly unsaturated).This is in the middle of protein supplements, containing a higher calorie count than standard proteins; yet not as much as most of the other mass gainers. This is a good thing. Yes, this is a mass gainer – yet, there are less than 500 calories per serving. This may make many guys think, ok, that’s not enough of my body. But, the better question is – how many calories can my body efficiently take in during one meal/shake? As you can expect, those 1,000 calorie mass gainers aren’t always the best option for efficiency. Hence, why your bowel movement quality may change while taking them. Always remember, there is no nutritional gain from something that results in diarrhea! So that brings us back to the calorie count of 485 per serving in Iron Mass. Are these 485 calories more significant in quality than say, half a serving of your typical 800 – 1,000 calorie mass gainer? We believe it is, given the sources. 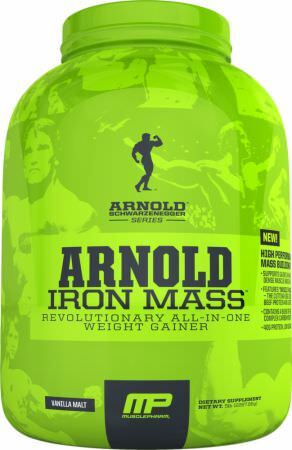 The protein content in Arnold’s Iron Mass is composed of Hydrolyzed Beef Protein and Lactoferrin. Hydrolyzed beef protein is pretty straight forward, but the Lactoferrin deserves a little explanation for better understanding and approval. Lactoferrin is a protein present in milk at approximately 0.5%. 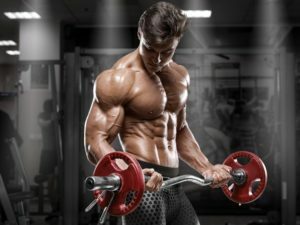 As one of the most bioactive proteins in whey protein, Lactoferrin has several unique properties that can benefit bodybuilders. So, be glad that it’s included, but also remember that we do not know the exact amount present in this 40 g formula; which inarguably is mostly hydrolyzed beef protein. Note: if you prefer less processed whey protein, then you should view our highest quality protein powders here. Iron Mass contains a carb blend consisting of Sweet Potato Powder and Barley Starch. Sweet potato powder is a nutritious, low glycemic carbohydrate source while barley starch does the same with a host of beneficial enzymes present! Together, this is hands down the most beneficial, nutritious, and moral carb blend we have ever seen in a mass gainer protein… By a mile! And it makes sense, considering Arnolds historic dislike for bread. The fat content in Iron Mass is pretty high, but that’s ok because this content is unsaturated for the most part. These 21 grams consist of Sunflower oil powder, coconut MCT powder, and whipped cream powder. Whipped cream powder is most likely the source of Lactoferrin mentioned above, leading us to believe that the actual Lactoferrin content is exceptionally low. Despite this, the fat blend as a whole is pretty beneficial with these specific unsaturated fatty acid sources that maintain well after processing. Iron Mass is a Respectable Mass Gainer! As you can see, Iron Mass was made extremely ethically (in relativity to other mass gainers). In fact, we really thank Musclepharm for their due diligence to work with someone like Arnold Schwarzenegger who clearly has zero compromise for his beloved bodybuilders and athletes. With that being said, we give our full mass gainer recommendation to Iron Mass. Compared to the competition, Iron Mass kills it! The carbs are healthy, the protein is lean, and there are plenty of unsaturated fats to keep that bad cholesterol down naturally along with the many benefits unsaturated fats have for athletes. The most beneficial time to take Iron Mass is going to be immediately post workout, every time. That’s when your muscles are the most hungry. However, the thing with mass gainers as a whole is that they are an effective tool at raising your total caloric intake, if yours is unreachable by diet alone. So, you can substitute snacks between meals, or worst case scenario a missed meal with Iron Mass. That works, or at least it’s better than nothing. However, remember this – nothing is better than real food. Don’t let this mass gainer be an excuse to slack. You need real food, like the foods we laid out in our own Best Muscle Building Foods List. 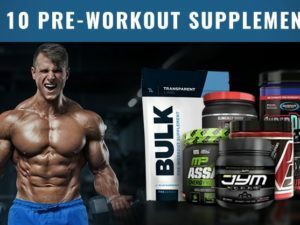 In the meantime, take a look around the rest of the site to get great information on bodybuilding and strength training. In addition, we’ve compared plenty of supplements and ranked the very best. Take a look!